Told through a stage performance by its main character when it appears she’s reached a period of success, Funny Cow recounts her life more as a form of therapy than as a part of an established routine (if you were in the audience you’d be wondering when the jokes are going to start). Starting with her childhood and moving through the various stages and relationships that have brought her to this point, ‘Funny Cow’s story is one that proffers a dispiriting look at the life of a woman struggling to find happiness, and a true sense of her place in the world. It’s a harsh movie about a harsh life, relentless in the way it portrays domestic abuse and the psychological effects it has on ‘Funny Cow’, and unforgiving of the Northern working class background that she comes from. Almost everyone is either violent, depressed, selfish, abusive, or a mix of all four. Only Angus is different, but it’s his difference from all the other men she’s known that makes him unacceptable; she just doesn’t trust that he can be so naturally kind. With happiness feeling like a dream that’s not just out of reach but completely unobtainable, co-star Tony Pitts’ screenplay keeps ‘Funny Cow’ firmly in her place, trapped by her past and fearful of the future. Of course, she has a wilful streak that gets her into trouble, and during her first stand up performance, out of it as well. But even her humour is harsh and unrelenting. A heckler suffers for his efforts, ‘Funny Cow’ using him as catharsis for all the abuse she’s suffered in the past. But she’s suffered too much for this to be anything but a temporary release. She’s angry too, and by using her stand up routine to express her anger, ‘Funny Cow’ finds a part of her life where she finally has some measure of control. As the unnamed title character, Peake is on superb form, audacious, brash, haunting, and fearless in her exploration of someone whose past is inextricably entwined wth her present, and to deleterious effect. Whether ‘Funny Cow’ is being mournful of her relationship with Angus, or laughing manically after having her nose broken by Bob, Peake is nothing less than outstanding. Making only his second feature, director Shergold adds poignancy to proceedings by having the older ‘Funny Cow’ cross paths with younger versions of herself, and he ensures that the humour is often pitch black – but still as devastating as the violence that’s depicted. 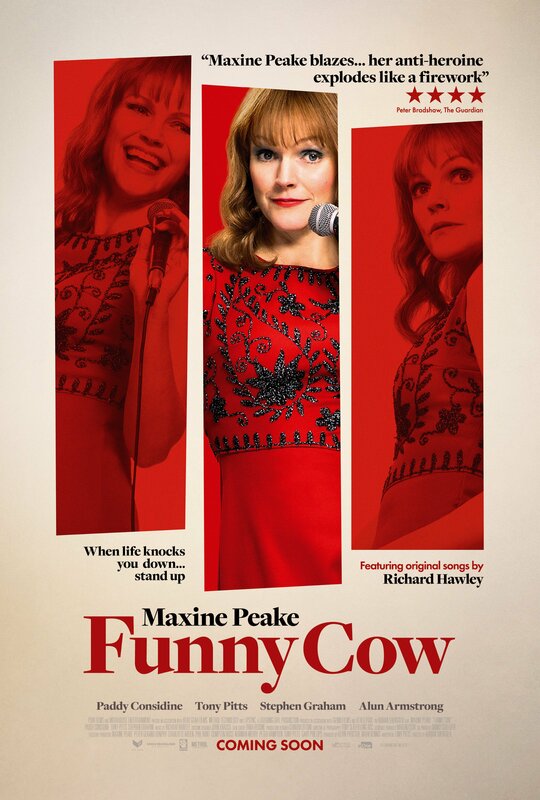 Rating: 8/10 – though as far from being a feelgood movie as you’re likely to find, conversely there is much to enjoy in Funny Cow, from Peake’s stellar performance, to a truly scabrous stand up routine, and flashes of magical realism in amongst all the tragedy; challenging and compelling, it also takes a sharp look at sexist attitudes of the period (the Seventies), and offers audiences an unflinching look at one woman’s attempt to break free from the patriarchal society that has continually aimed to hold her back.